Ultra Slim Design -- With only 0.6 inches thickness,as slim as your phone, a little bit heavier than a Samsung Galaxy Note 9, this ultra thin portable charger enables you to slip it into your bag easily.Tiny mosaic design on the smooth surface makes it eye-catching. Huge Capacity Dual Output -- 12000mAh high capacity charges Samsung Galaxy S9 2.5 times[NOT include USB-C cable], iPhone X 2.8 times[NOT include iPhone cable], HUAWEI P20 2.2 times.Recharges this external battery pack within 6 hours with 2A input. Dual USB output(Quick Charge 3.0 output & normal charging output) can charge two devices simultaneously. Superior Quality -- Integrates top quality Li-ion polymer battery with Yoobao intelligent protective chips in this power bank, ensures your phone and the power bank's safety and stability when charging. More than 1000 times recharge cycles over the life of the battery for your long term usage. 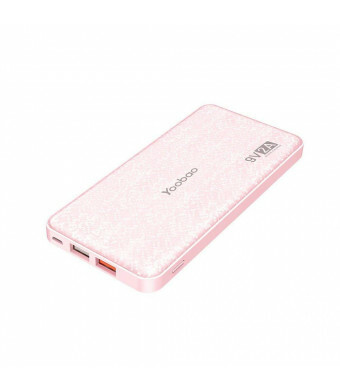 What You Get -- Yoobao 12000mAh Qualcomm Quick Charge Power Bank Q12, Micro USB Cable, User Manual, 24 Months Warranty(NOT include Apple or USB-C cable or adapter). Faster and safer charging with our advanced technology.